Montalvo Arts Center - Tiffany Singh from Content Magazine on Vimeo. With The Bells of Mindfulness, Tiffany Singh (Auckland, New Zealand) sought to deeply examine the idea of sacred spaces. 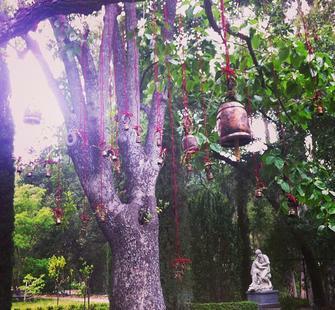 Drawing on the Buddhist tradition of using temple bells as an aid for mindfulness, she suspended 1000 handmade and fairly traded metal bells and 1000 paper cranes attached to brightly colored ribbons from a persimmons tree in Montalvo’s Italianate Garden, creating a tranquil space for rest and reflection. Listening to the bells on the tree. With intention choosing a bell. Taking the bell to a sacred place. Keep your eye out for bells. If you find one, marking someone’s sacred place, you may remove the bell and go back to step 3. As documentation of the bells journeys grow on the interactive Flicker site and Tumblr, a complex portrait of what sacred space means to us today will begin to emerge. See video installments documenting the development and evolution of The Bells of Mindfulness by the San Jose Film Production Society on our blog and read an interview with the artist. Of Maori, Indian, and Pacific Island decent, Tiffany draws inspiration from her varied background to create work consisting largely of natural mixed-media-based installation and participatory community building. She has garnered critical acclaim for her use of ceremonial and ritualistic materials gathered from and transcending everyday culture. Sourcing the bells from rural artisans in western India, Singh hopes The Bells of Mindfulness will inspire conversations about the importance of better equity in international trade. The Bells of Mindfulness is presented as part of COME HEALING, Montalvo Art Center’s 2013 Art on the Grounds exhibition. Find out more about Janmamad Salemamad Luhar, the maker of the bells. The Bells of Mindfulness is presented as part of COME HEALING, Montalvo Art Center’s 2013 Art on the Grounds exhibition. It is organized in association with Flourish: Artists Explore Wellbeing, a multi-disciplinary program about health and happiness initiated by the Lucas Artists Program at Montalvo Arts Center. The Bells of Mindfulness was made possible thanks to the generous support of Pierce Leggin, Alexis Costanza, Ricky Dellinger, JP Emodi, Akos Meggyes, and Joshua Pausanos from The Film Production Society at San Jose State University; Farinaz Wadia and Aisha Luther from Indika; Pam and Gabi Abaci, Darla and Maddy Booth, Sophie and Sandy Cichanowicz, Shannon and Kelly Enriquez, Kathy and Haley Fetsch, Gail and Jennifer Kepler, Amanda Lane, Cheri and Micayla Mendoza, Tala and Nadia Roohparvar, and Lisa and Ashlyn Simpson from the National Charity League; and Kelsey Berryhill, Ginny Bloem, Emily Chao, Annie, Katrina, Lily Lee, Sanjana Pandit, Christine and Megan Penland, Pooja Shetty, Mira Stoyanova, Susie Taylor, Dennis Tolomei, Dan and Charmaine Warmenhoven, and Serena Ying.